This is Daisy… and as of today, she’s part of the Snail household. We first met her a couple of months ago when visiting a friend. This particular friend fosters rescue dogs and Daisy was one of her charges. She was a lovely and friendly dog, but we weren’t in the market for a new canine at the time. A week or so later someone said they wanted to adopt her and that was that, but for one reason and another the prospective adopters kept putting things off, a situation that went on for several weeks and eventually it all fell through. Poor Daisy. So, last Thursday, knowing that I liked her, her foster mum sent me an email just to let me know that Daisy was available once again. First, we had to get Sam’s approval, but once it was clear that all was well in that department, things moved rather quickly and now it’s Monday and we have two dogs once more. Me too… so sad that her previous owners didn’t want her any more. I hope Daisy knows she’s the luckiest dog on the planet! Almost as lucky as you. Congrats! I think she might have been. Well, that worked out extremely well! Daisy looks lovely and if Sam is happy too then everyone is in the right place! I’m so happy for you – we need to have an animal of our own to love and tend and give the good life to don’t we. Max would approve I’m sure! Yay! Interestingly, Sam is treating Daisy exactly like she treated Max, so all seems to be well. From the moment they met they seemed completely comfortable around each other. We had a lovely walk this evening and you’d have had a hard job guessing that she only arrived today. Don’t you love it when it all works out right! I’m so pleased for you all! I LOVE HER. I always wanted a golden cocker spaniel , but somehow had a blue roan and then a black one. One day I may finally manage to pursuade Mr E. You are a very lucky snail and Daisy is a very lucky girl. Not a breed I have ever considered before, but she was the right dog in the right place – serendipity I think. Oh, how wonderful! Read this with a lump in my throat. Daisy looks like such a lovely, darling dog. Best to all of you! Hope to see more pictures. Oh, she’s a darling curly brown-eyed blonde. I’m glad Daisy Snail and Sam Snail are friends already, and that she’s made an excellent start at her job of happiness in the Snail Shell. She is cute! Good luck with your new family member. She’s a real beauty. I hope all goes well for you in both behaviour and health stakes this time round – it sounds like you’re off to a good start. So far she has been a delightful house guest… once she realises that she lives here I’m expecting her to be led astray by Sam (who is a terrier after all). Congratulations Jan, she looks a sweetie. She should fit in very nicely with you. She is a real sweetie and seems to have hit it off with Sam straight away. She’s been here less than 36 hours and they are already choosing to share a dog bed! she is a real sweetie! Wonderful!! For you, Sam (who needed a friend), and, most of all, Princess Daisy! 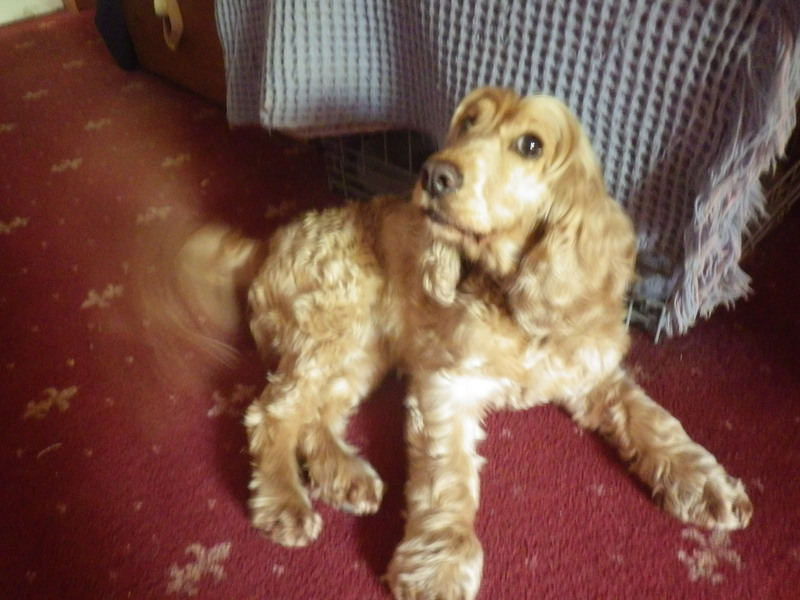 She’s doing so well – settling down without any trouble and being generally happy and waggy.